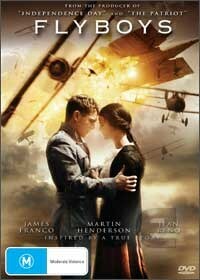 Flyboys is the epic wartime drama that revolves a squadron of American pilots during the first world war who volunteered to fight for the French against the German juggernaut. These Americans were accepted into the hearts of the French people and were dubbed the Lafayette Escardrille who became legend in wartorn Europe. The movie is tastefully directed by Tony Bill who assembles a star studded cast of actors such as James Franco, Jean Reno and Jennifer Decker to deliver one of the most intensive and thrilling stories from 1914 during the Great War. Bill does a wonderful job at drawing in a variety of genres into this movie that include romance, action and drama which proves how powerful the human spirit can become during these dark times. Gripping! Presented in an aspect ratio of 16:9 widescreen with Dolby Digital 5.1 and DTS, this is truly a cinematic epic that will appease even the most strident of movie goers. Definitely a must have for those who may have missed this movie on the big screen.